Hawaii Volcano's Lava Spews 'Laze' Of Toxic Gas And Glass Into The Air : The Two-Way Lava from the Kilauea volcano is pouring into the Pacific Ocean, generating a plume of "laze" — hydrochloric acid and steam with fine glass particles — into the air. Lava flows from fissures near Pahoa, Hawaii, on Saturday. Lava from the Kilauea volcano is pouring into the Pacific Ocean off of Hawaii's Big Island, generating a plume of "laze" – which Hawaii County officials describe as hydrochloric acid and steam with fine glass particles — into the air. Officials say it's one more reason to avoid the area. 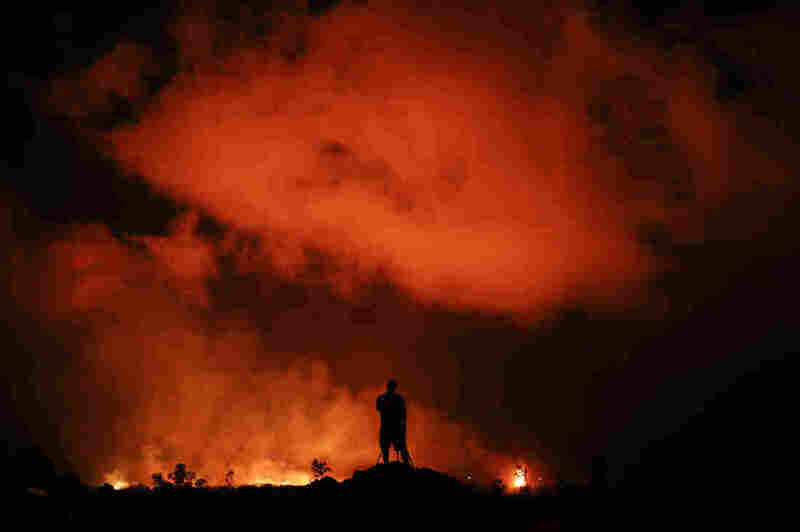 "Health hazards of laze include lung damage, and eye and skin irritation," says the Hawaii County Civil Defense agency. "Be aware that the laze plume travels with the wind and can change direction without warning." The U.S. Coast Guard is monitoring the area to help keep people away from the coast; the county says that "only permitted tour boats are allowed in the area." 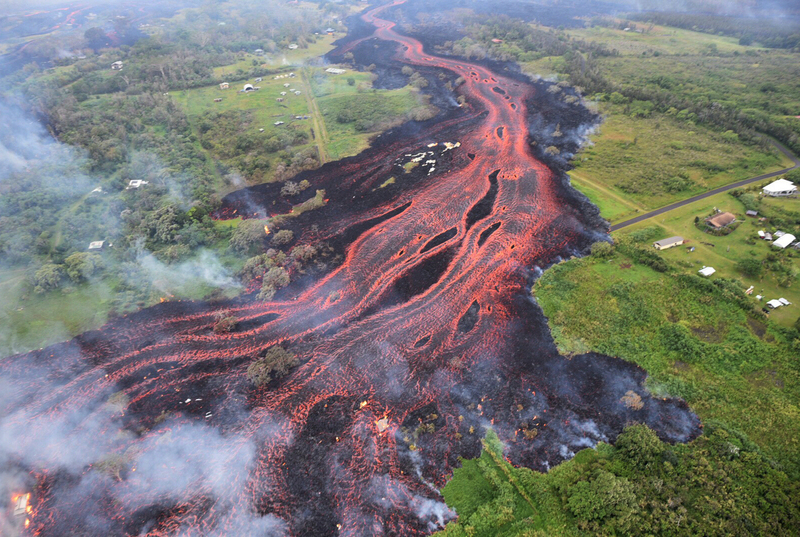 Lava erupts and flows from a Kilauea fissure on Friday in Kapoho, on Hawaii's Big Island. The Leilani Estates neighborhood, near Pahoa, where numerous homes have been destroyed by lava from Kilauea. 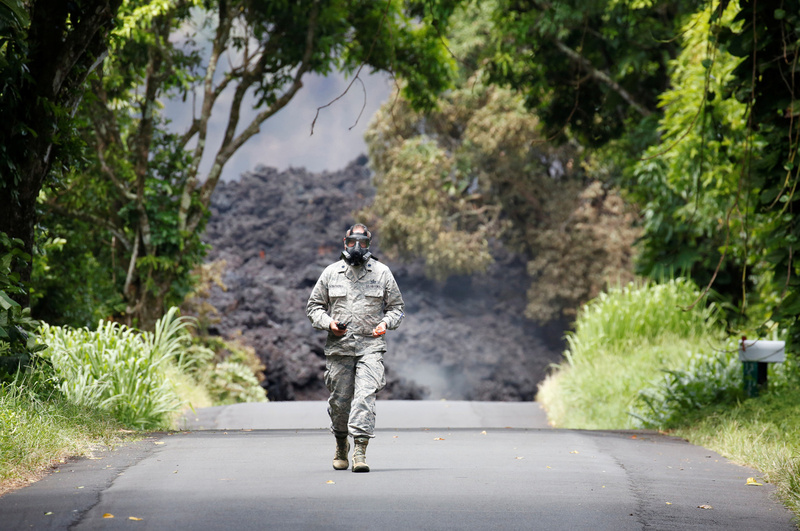 Lt. Col. Charles Anthony of the Hawaii National Guard measures sulfur dioxide gas levels at a lava flow on Highway 137 southeast of Pahoa. Two lava flows are now entering the ocean, and emissions of sulfur dioxide have tripled downwind of at least 20 fissure vents, according to the civil defense agency. "There continue to be explosions and earthquakes from the volcano's summit — many are saying it sounds like a war zone," reports Jackie Young of Hawaii Public Radio. "As soon as the generators go off, it's just booming," Big Island resident Corey Hale says. "It's really loud booming." 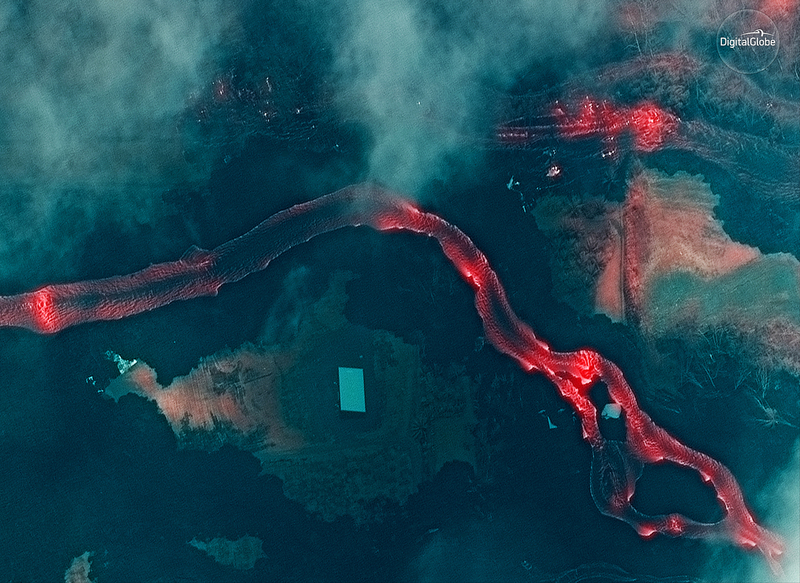 An infrared satellite image shows the lava flows along the East Rift Zone, just to the east of Leilani Estates and due south of the Puna Geothermal Venture. 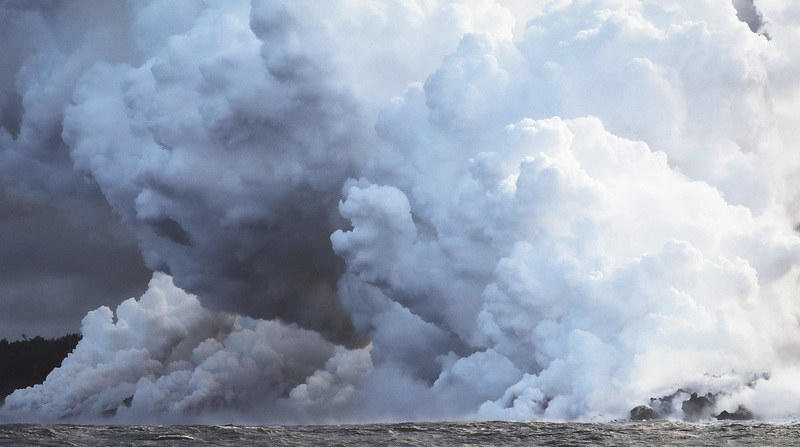 Steam plumes rise as lava from Kilauea enters the Pacific Ocean. Officials are warning residents to stay away from plumes of laze, which consists of hydrochloric acid and steam with fine glass particles. 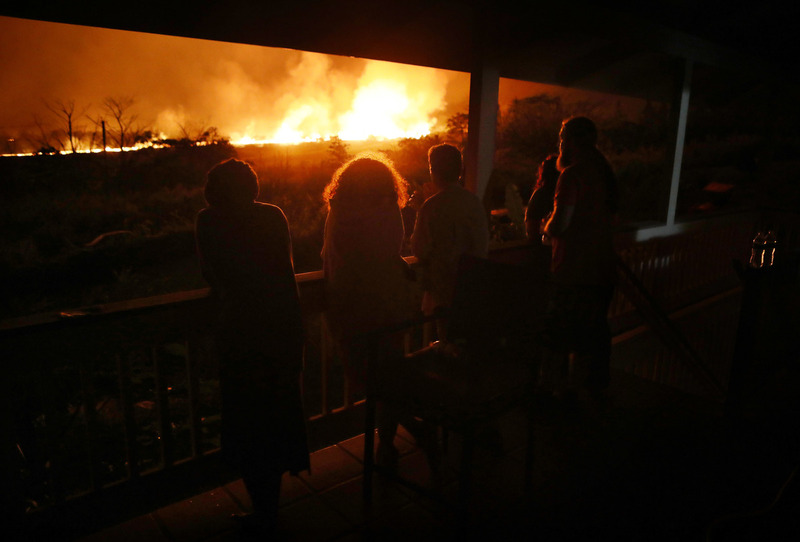 Residents view lava erupting from one of Kilauea's fissures, at a small viewing party on a neighbor's porch, on Hawaii's Big Island. Hale has lived in Lanipuna Gardens for about three years. She evacuated her home on May 3, the day of the first big eruption. Nearly every day since then, she and her cat have been staying in the parking lot of the community center in Pahoa. Based on the latest information she has, Hale says her land is surrounded by lava on three sides but hasn't yet been consumed by the flows. "It's been scary," she says. "None of us think that there's going to be some sudden crazy random eruption here in the parking lot, but it's just scary to be so close to such a powerful natural event, and feeling the ground shaking all the time and see the red of the sky. And then just not knowing — you know, the not knowing." Lava flows near a house on the outskirts of Pahoa. 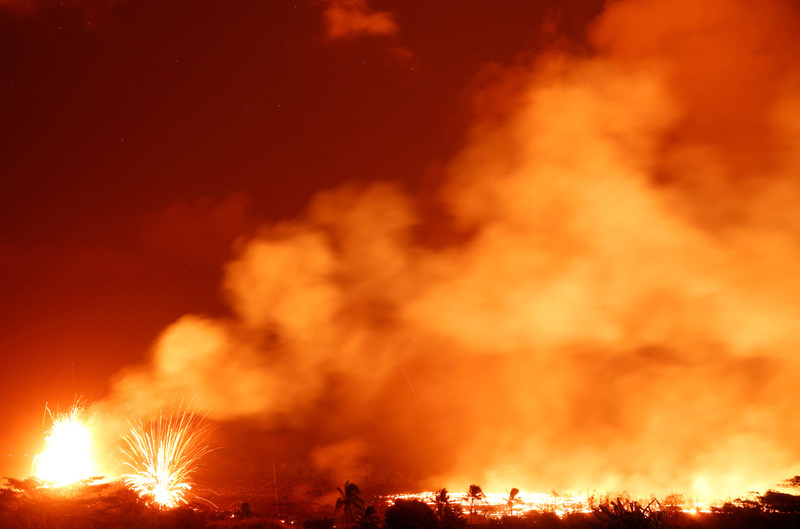 Lava shoots into the sky on the outskirts of Pahoa. 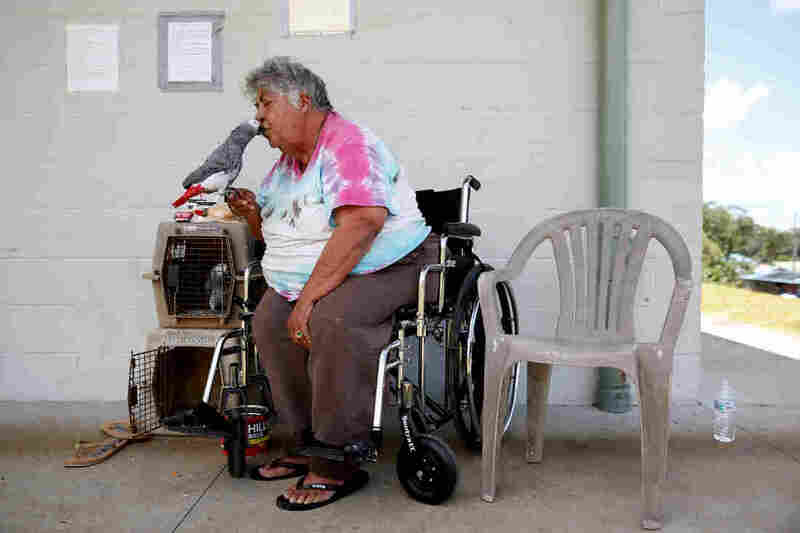 Linda Dee Souza, 72, of Kalapana-Seaview, kisses one of her parrots Tuesday at a Red Cross evacuation center in Pahoa. Late Saturday night, explosive eruptions at Kilauea's crater sent an ash cloud up to 10,000 feet into the sky, according to the U.S. Geological Survey. The explosions registered as the equivalent of a 5.0 magnitude earthquake, the agency says. Residents are also being warned of possible new evacuations, particularly in cases where lava flows threaten to cut off arterial roads. A lava flow crossed one of those roads, Highway 137, on Saturday. 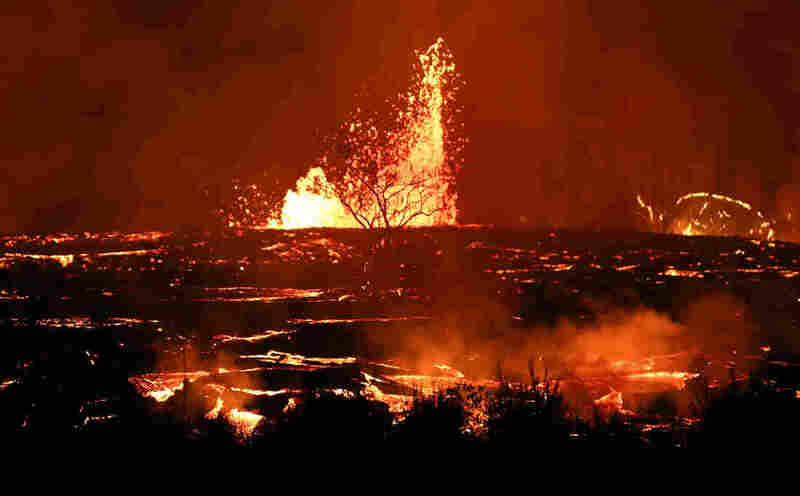 Despite the disruption to her life, Hale says she has also found beauty in the eruptions. "It's an amazing experience to be on the ground watching Pele do what she does," she says, referring to Hawaii's goddess of volcanoes. "This is a beautiful, amazing event, to be here at the birth of new lands. And there's been sadness. And you know, there's grief for losing what we had and what it was. But we aren't sad. To live out here you gotta be resilient or you don't make it." When asked whether she will try to live again on her property after the eruptions have finally stopped, Hale says, "Absolutely. Absolutely." In its latest update on the overall status of Kilauea, the USGS says, "Seismicity and deformation continue at the Summit. Deflation is ongoing and additional earthquakes are expected as long as the summit continues to deflate." Lava flows from a fissure in Kapoho on Saturday. 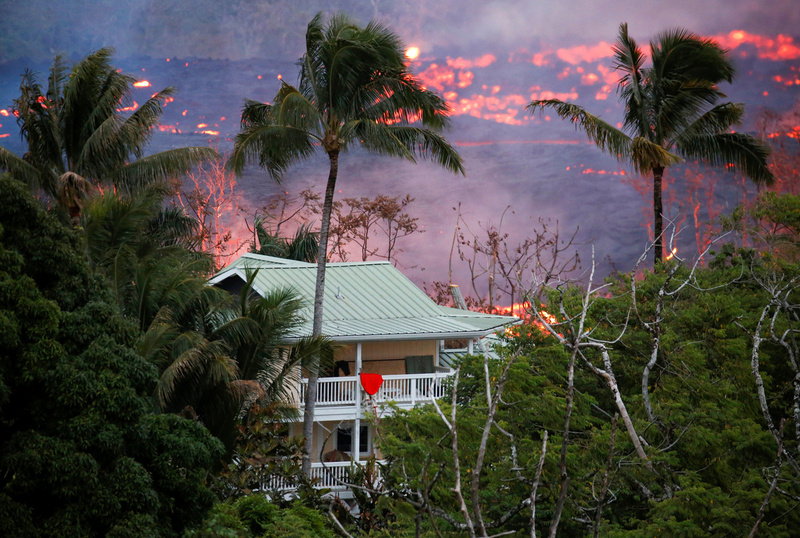 Peter Vance, 24, photographs lava erupting in Leilani Estates on Friday. 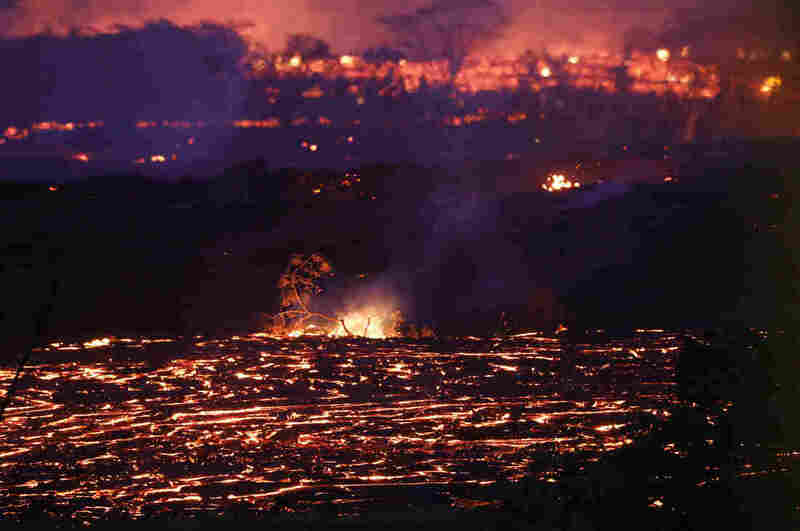 A previous version of this story misspelled several references to Kilauea as Kileaua.